On October 7th 2014, the BBC announced that CBeebies had signed up to broadcast Twirlywoos, a new property from Ragdoll Productions. That's the company behind numerous household name children's shows including In The Night Garden and Teletubbies. The show mixes stop-motion animation with real-life footage and is focussed on four exceptionally cute and inquisitive bird-like creatures called Twirlyoos. They are fascinated by the world around them and are always looking to learn something new. The stories are designed to encourage preschoolers to interact with the stories and make their own connections, which aids their learning. The show has been described by Kay Benbow, the CBeebies Controller as "brilliantly clever and funny with strong educational element underpinning it." Character toy specialist Golden Bear won the rights to hold the master toy licence. Their expertise in creating appealing children's products means that their plush toys of characters GreatBigHoo, Toodleoo, Chickety and Chick were guaranteeed best sellers when they launched in June 2015. The company also announced that the Twirlywoos home, better known as The Great Big Red Boat was to be the featured playset. 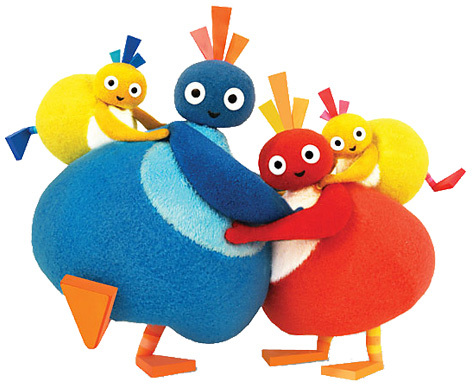 Additions to the ranges include the Run-Along Fun Sounds Twirlywoos. Available in all four characters, each one makes their own unique sound as they run along the floor. The shows fans should also look out for the Quacky Bird soft toy and the Fun Sounds Peekaboo. This mischievous little character is made from textured fabrics and also features warbling sounds.